“And there’s a legend—she had only vague details—that all couples who are meant to marry are connected by an invisible silver cord which is wrapped around their ankles at birth, and in time the matchmaking gods pull those cords tighter and tighter and draw the couple slowly toward one another until they meet.” So says Miss Kate Begley, Matchmaker of Kenmare, the enigmatic woman Ben MacCarthy meets in the summer of 1943. As World War II rages on, Ben remains haunted by the mysterious disappearance of his wife, the actress Venetia Kelly. Searching for purpose by collecting stories for the Irish Folklore Commission, he travels to a remote seaside cottage to profile the aforementioned Matchmaker of Kenmare. Ben is immediately captivated by the forthright Miss Begley, who is remarkably self-assured in her instincts but provincial in her experience. Miss Begley is determined to see that Ben moves through his grief—and a powerful friendship is forged along the way. But when Charles Miller, a striking American military intelligence officer, arrives on the scene, Miss Begley develops an intense infatuation and looks to make a match for herself. Miller needs a favor, but it will be dangerous. Under the cover of their neutrality as Irish citizens, Miss Begley and Ben travel to London and effectively operate as spies. As they are drawn more deeply and painfully into the conflict, both discover the perils of neutrality—in both love and war. Steeped in colorful history, The Matchmaker of Kenmare is a stirring story of friendship and sacrifice. New York Times bestselling author Frank Delaney has written a lush and surprising novel, rich as myth, tense as a thriller, and like all grand tales—harrowing, sometimes hilarious, and heartbreaking. In Frank Delaney’s sequel to Venetia Kelly’s Traveling Show , Ben MacCarthy is still on the lookout for his missing wife while working for the Folklore Commission, gathering and documenting local traditions. When his employer asks him to research matchmakers his travels lead him to the door of Kate Begley and her grandmother, Kenmare’s famous matchmakers or “brokers of the next generation” as Kate explains it. Ben and Kate form an instant bonding which blossoms into a deep friendship while they traverse war-ravaged countries at the end of WWII looking for Kate’s own lost spouse. The Matchmaker of Kenmare is told by Ben as a letter written to his two children as he reminisces about his life while he knew Kate. From dodging bombs in France, being chased by German soldiers, traveling to the United States with a giraffe, a pig and a fat man there is never a dull moment. To me, the characters Ben and Kate are the best part of the novel, both fabulously complex people who you come to know as Delaney peels away their inner depths like layers of an onion. Ben is a gentle, loyal man haunted by the sadness of losing his love and scared by the violence within him who is blindlessly devoted to Kate. Kate was a tad bit more enigmatic, tending to hide her feelings beneath a tough exterior, though every now and then showing her vulnerable side. Having not read Venetia Kelly’s Traveling Show I was afraid that I would be a little lost at times but I am happy to report that that was not the case. Delaney gives you enough background to understand but without retelling the story. The ending is a little abrupt but gives a hint at a third novel, which pleases this reader immensely! 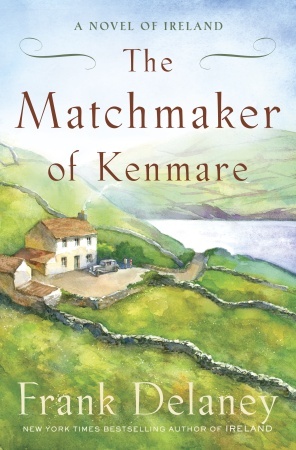 Written with Delaney’s excellent storytelling ability, The Matchmaker of Kenmare is one book you will not want to miss! For more information, please visit Frank Delaney's WEBSITE. FTC: This was sent to me by the publisher in exchange for a fair and honest review. Great review, Amy. I really want to read this. I loved Venetia Kelly's Traveling Show. Did you read my review of The Raven Queen? What did you think? Thank you for a lovely post on this book. Amy: I love to read your reviews as they always inspire me to grab that book to read as soon as possible.